It's springtime, which means North American black bears have arisen from their winter slumbers and gone in search of food with gusto. In a few states, hibernation's end has been marred by higher-than-average clashes with human populations -- in Maine, for example, there have been 44 complaints of hungry bears in four weeks, as the animals rummage through garbage bins and knock down bird feeders. State wildlife biologists are taking a stand to keep these animals from foraging near humans. Their solution? People need to stop feeding wild bears, says Andrew Timmins, a bear biologist for New Hampshire's Fish and Game Department. "A fed bear is a dead bear." Timmins tells the AP that anyone who feeds bears puts the animals in harm's way. Once bears have acquired a hankering for human food, the bears might go as far as to smash into cars and garages, and are subsequently put down. Bears accustomed to human food aren't problematic only in the Northeast -- Heavenly, a one-year-old bear cub, was rescued near Lake Tahoe along the border of California and Nevada, and could not be released back into the wild because he had lost his fear of humans. "I think these people that feed bears, they're driven so much by the desire to see these animals in their yard," Timmins says. It's not just wildlife watchers who are feeding the black bears -- in 12 states, it's legal for hunters to bait black bears, too. Hunters often use sugary, high-fat human foods to lure bears; a 1999 survey found that hunters in Virginia set out over 6 million pounds of bait food in a year, including pastries, grease and corn. In Maine, legislators are looking to end baiting with a November ballot that could stop the practice, as well as end bear hunting with traps and dogs. Although opponents of the referendum say that hunting keeps the bears manageable, supporters argue that baiting the bears, in fact, does the opposite. 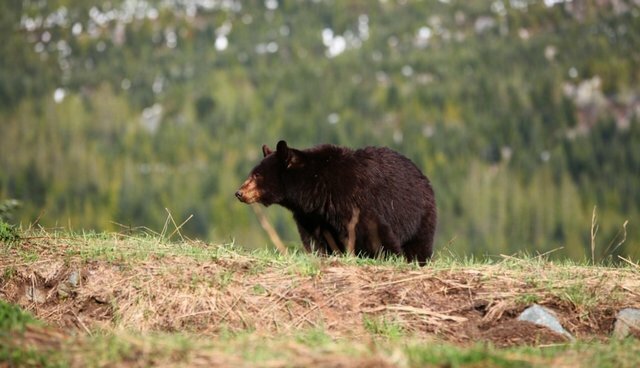 The populations of bears stabilized in Colorado, Oregon and Washington after these states banned baiting, according to the conservation group Mainers for Fair Bear Hunting. Baiting bears is "growing the population," says Katie Hansberry, a leader in the campaign against baiting. "It's the problem, not the solution."